There has been a significant reduction in applications for Ghanaian passports following a collaborative exercise between the security agencies and some of the foreign embassies in the country. This has made it almost impossible for people to acquire multiple Ghanaian passports and this explains the reduction in applications.Available records from the Ghana Immigration Service (GIS) indicate that applications for passports for the second quarter of this year, May to June, were just about half of applications for the same period last year. For the second quarter of 2003, the service received about 30,500 applications, whereas it received about 18,000 for the same period this year.The second quarter is considered the peak season for passports because most Ghanaians prepare to travel within the third quarter. 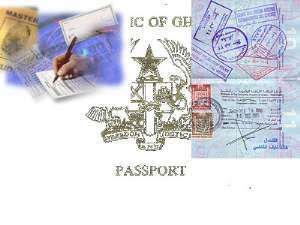 Mrs Elizabeth Adjei, the Director of the GIS, who disclosed this in an interview, explained that the introduction of the biometric technology at some embassies now made people uncomfortable going in for multiple passports. She said with the technology, the fingerprints of visa applicants were registered on the equipment so that even if one went there with a new passport under a new name or particulars, he or she would be found out, since the gadget would identify the applicant as having applied for a visa before with the requisite particulars. Many people now found it unwise possessing multiple passports under different names, she added.According to Mrs Adjei, the establishment of the Documents and Visa Unit by the police to combat the use of fraudulent documents at the embassies had also contributed enormously to dealing with the problem. She said more than 200 people had so far been arrested by personnel of the unit.Mrs Adjei said the installation of the Travel Document Verification Laboratory by the GIS at the airport, supported by airline liaison officers, had also contributed to the reduction in applications for passports. She said between January and September this year, 520 people were arrested at the Kotoka International Airport for using various fraudulent documents.Some of these, she noted, included photo substitution, impersonation, page substitution, passport swapping and visa washing. Mrs Adjei said the vigilance and efficiency of staff of the Passport Office had also contributed to the reduction in applications.According to her, reports from some missions, also indicated that there was an over 20 per cent drop in visa applications during the peak season, compared to a normal 20 per cent increase in applications for the same period in previous years. Mrs Adjei said in terms of visa applications to the missions worldwide, Ghana is ranked fifth in the volume of applications but is first on the rate of refusal. That, she said, the authorities had explained to be due to the submission of fraudulent documents to the missions, with more than 40 per cent of applicants submitting fraudulent documents. The director said it was to check this that the security agencies decided to initiate various moves from different perspectives, with a view to nipping the problem in the bud.“The result of this is that a lot of the passport contractors have been weeded out of the system,” she stated, adding that “there is a great chance that you will be arrested at the embassies and a greater chance of arrest at the airport if you use fraudulent documents”. Mrs Adjei said the security agencies were doing all these to safeguard the integrity of the Ghanaian passport and urged Ghanaians to join in the exercise, since the long-term benefits were enormous.